In the West and the West Fjords, one can read the geological history of Ice-land, from its formation 15-16 million years ago until about the time of the settlement in the ninth century, which is when volcanic activity ceased in the region. The oldest rock formations are found at Kögur in the West Fjords, the youngest in the inner reaches of Borgarfjörður, and the region has an unusually wide variety of natural fea-tures. Every kind of volcano is found here, and water flows from the earth in every form, from cool, sparkling miner-al water to Europe’s most voluminous hot spring, Deildartunguhver, from which water pours at 97°C at a rate of 180 litres per second. The clearest sign of volcanism is the perfectly formed crater of Snæfellsjökull, with its glacial cap, at the tip of the Snæfellsnes peninsula, to which various mysterious powers have been attributed. This is now a National Park, and Snæfellsnes is now benchmarked as a Green Globe 21 sustainable community with emphasis on tourism. In Stykkishólmur, New York Artist Roni Horn has opened the “Library of Water”. The main room of the library features a series of 24 glass columns filled with water, originally collected as ice from various Icelandic glaciers. Words are written on the floor, reflecting in the glass. The birdlife of the region is also varied. Breiðafjörður is a mecca for birdwatchers, who may even spot the monarch of Icelandic birds, the white-tailed eagle. In olden times West Iceland and Breiðafjörður were flourishing agricultural regions with plentiful food resources. Many of the Icelandic sagas took place here and in the West Fjords. Historic sites in the region include Reykholt, home of the medieval chieftain/scholar Snorri Sturluson, and the town of Borgarnes with its Settlement Centre, where visitors can see two exhibitions featuring audio-taped narrative: one on the settlement of Iceland, and the other on Egill Skallagrímsson, one of the most colourful personalities of the Age of Settlement. Another intriguing destination is the reconstructed saga age farmstead at Eiríksstaðir, home of Erik the Red. Eiríksstaðir is also reputed to be the birthplace of Eiríkur’s son Leif the Lucky, who found the New World. 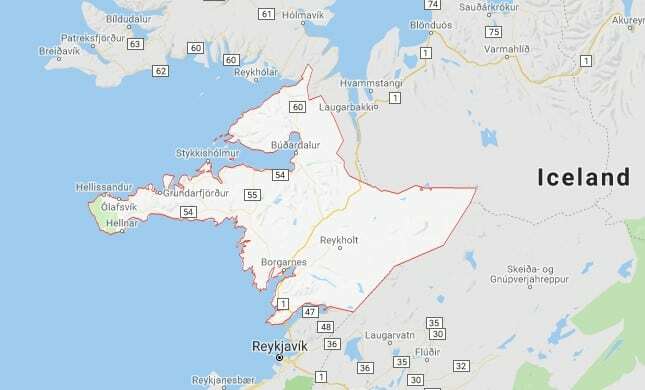 Two universities in Borgarfjörður have been growing rapidly in recent years: the Bifröst School of Business and the Agricultural University at Hvanneyri.